Sokojikara's raw, earthy "Bambusa" Katana is inspired by the noble bamboo plant. “Bamboo?” you ask. “What does a mundane, weed - little more than panda fodder - have in common with a rare, custom-quality handcrafted sword like the Bambusa?” The answer: unmatched strength, incredible affordability and value, ideal weight and near-endless versatility, to name a few. There’s more to the common bamboo plant than meets the eye. Among both natural and manmade materials, bamboo is one of the strongest on earth, as proven in countless scientific trials. This unassuming “weed” withstands compression better than concrete and boasts greater tensile strength than steel, all at a fraction of the weight and cost. Similarly, theres’s more to the Bambusa Katana than meets the eye, though - unlike its namesake plant, the bamboo - this traditional Japanese samurai sword is beautiful, eye-catching and no doubt impressive from the very first glance. Many of Bambusa’s greatest treasures lie beneath its striking visual facade, and some - like clay tempering - are even altogether intangible. Just as engineers continue to unearth new uses for bamboo, there are always new treasures to discover in the Bambusa Katana. 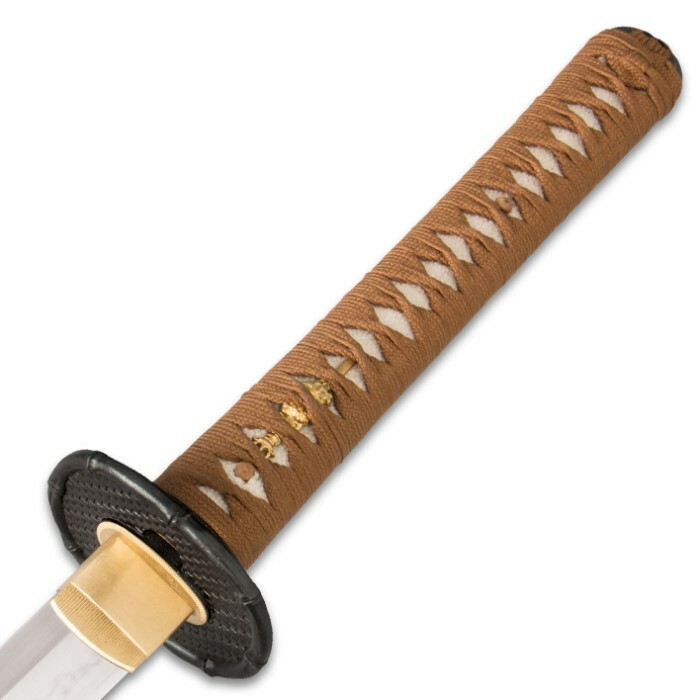 This distinctive traditional Japanese samurai sword is an infinite swordcraft goldmine, never ceasing to yield rich sword-wielding experiences from the moment you first grasp the tsuka. Clay tempering imparts edge retention that's simply without equal. Like a koi gliding through a still pond, the Bambusa's blade slices through rolled bamboo tatami mats and even cinder blocks cleanly and effortlessly, suffering neither crack nor fissure and all-the-while retaining its razor sharp edge. The Bambusa is able to withstand such punishing cutting trials thanks, largely, to clay tempering. Prior to the intense heat of the hardening phase, Sokojikara's seasoned swordsmiths coat the newly formed, unrefined blade with clay - a thin layer along the edge, a thicker layer on the body and spine. When the blade emerges from the hardening forge, the clay layers' contrasting thicknesses cause the steel to cool at slightly different rates, yielding two distinct hardness regions. The less-insulated edge cools faster, making it harder for superior edge retention and shear strength. The thicker, more insulating coat of clay causes the body/spine to cool more slowly, rendering it "tougher"- less brittle, more flexible and better equipped to absorb impact energy. Though conceptually simple, clay tempering requires skilled hands and years of experience. It’s a slow, labor-intensive process that has changed little since its 15th century origins. But when you see the Bambusa in action, you’ll undoubtedly agree it’s well worth the time and effort. The Bambusa's weight is shrewdly distributed to maximize swinging momentum and power, blow after devastating blow. This impeccable balance also improves control and responsiveness, allowing for greater agility and flexibility in combat. 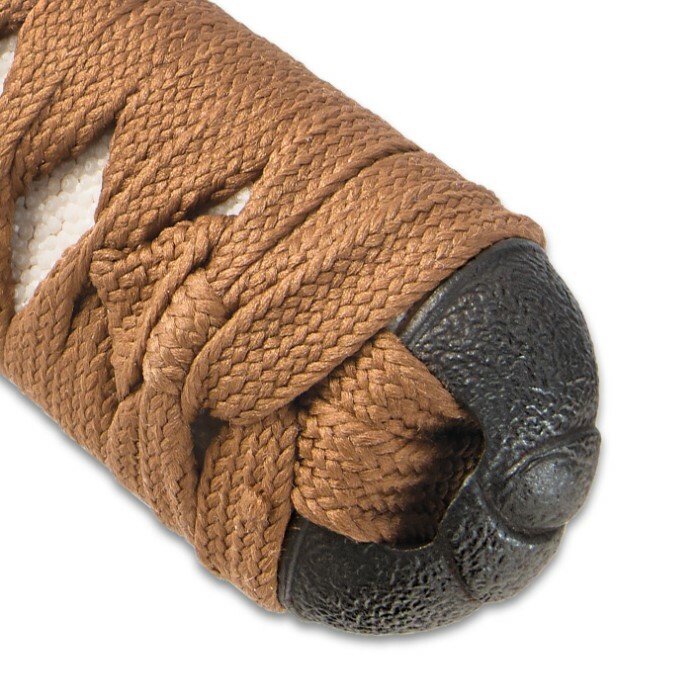 The delicately textured genuine ray skin same and soft braided ito that cloak the tsuka afford a comfortable, no-slip grip, further enhancing the Bambusa’s superb feel. Flawlessly cast from iron like katana of ages past, the tsuba is embellished with fine reliefs that depict bamboo stalks on a delicate woven rattan background. A classic brass menuki is nestled between ito and ray skin same, offset by traditional mekugi that are - fittingly - made of bamboo. The Bambusa has proven itself time and again, and it holds its own against any of today's most expensive katana, outperforming many. But the old cliché is true - "action" does indeed "speak louder than words," and at this unbeatable, downright unheard of price, why deny yourself the opportunity to experience Sokojikara's Bambusa Katana for yourself? No matter how you use it, with proper care you can enjoy it for a lifetime, then pass it down to your children, grandchildren or great-grandchildren! The Bambusa is heirloom-quality and built to be treasured by generations of your descendants - your legacy preserved in hand forged steel. Item appears as described. Sword appears very well made. I was surprised that it did not come in a nice wooden box! PostPosted: Fri 13 May, 2016 6:52 pm Post subject: Sokojikara Katana Review	Report this message Reply with quote Edit this post There are two katanas in the Sokojikara line. Both are $299. 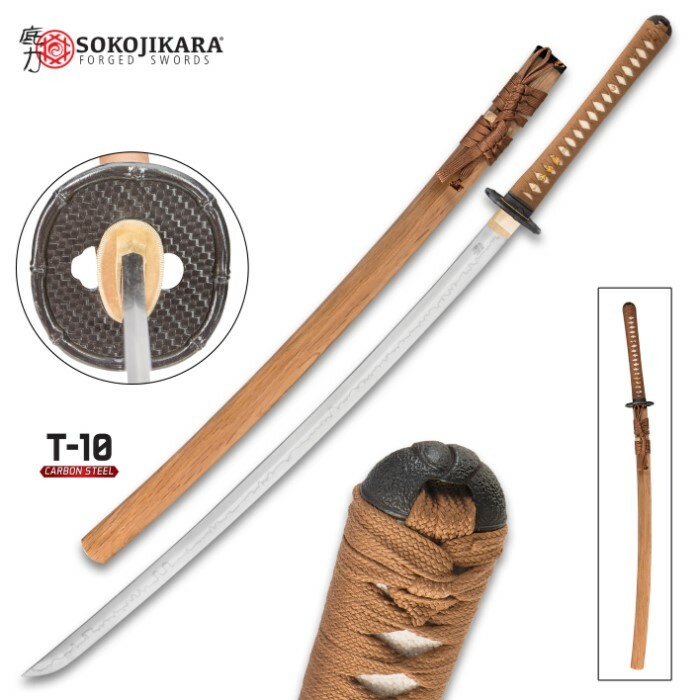 Normally I wouldn't go for a katana in this price range, but I liked that it's T10 steel as opposed to the 1040-1065 carbon steel that you normally see swords made out of in this range. I also liked the longer handle than the 10" you normally see on swords. I purchased this one. 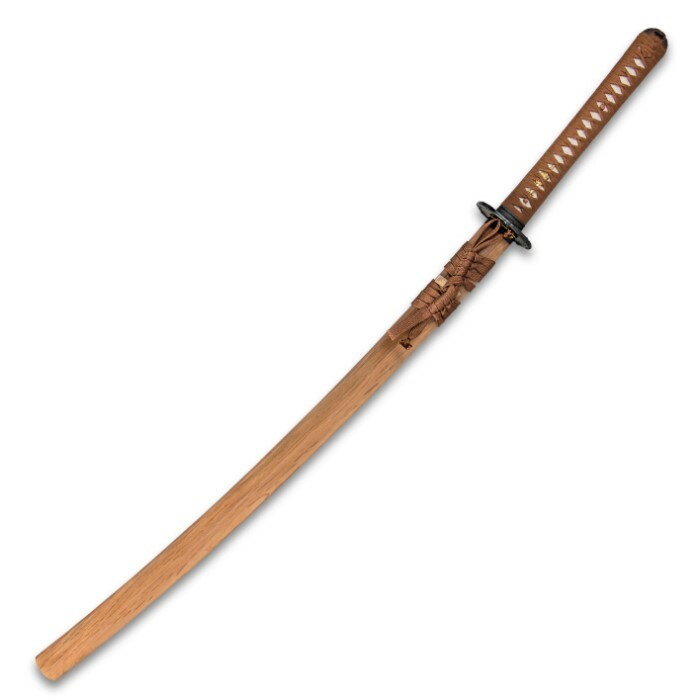 The specs on the sword I received are: Blade length: 28 5/8" Blade width at habaki: 1 5/16" Spine width at habaki: 5/16" Spine width at tip: 1/4" Handle length: 11 5/8" Handle width: 1 1/2" Overall length: 40 3/8" The handle is wrapped in real ray skin. The tsuba, fuchi and koshira are all cast steel. The menuki and shoto-dome are brass. The blade has a real and beautiful hamon, but it is not as polished and pronounced as on other swords.I have not removed the tsuka to look at the tang, but the sword is double pegged, and judging by how far down the second mekugi is, I'd say it's substantial. The habaki fits VERY tight in the days. The koiguchi is of water buffalo horn, and the kurigata is of the same wood the saya is made from. I'm not sure what the wood is, I would guess maple...? The sageo is a polyester material and of a proper length to secure the sword in your obi for iaido practice. The sword is a bit blade heavy, but I like the heft for cutting. I cut some bamboo with it, and it did pretty well (though, the bamboo was still very green... I hope to practice on some more dried pieces, and tatami mats in the near future.) I purchased this sword for the purpose of using it in martial arts and am quite pleased with it. If someone is looking for a sword to practice iaido or tameshigiri, I would recommend this over other swords in its price range.